Cellos - Hire an online session cellist for recordings. The Cello (or Violoncello) is an instrument with a vast range, starting from 2 octaves below middle C and extending up almost 5 octaves. It has a huge array of tonal possibilities, being one of the most versatile and striking instruments of the orchestra. Clients looking to add real strings to a track frequently hire cellists (or cello player) for recording sessions when they are looking for powerful, rich sounds in the lower register. 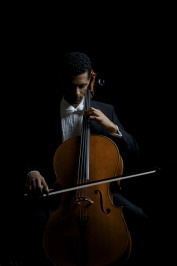 The session cellists who work with string section are all soloists in their own right and many clients take advantage of their expertise by asking for a string arrangement that makes the most of gorgeous solo cello lines. A professional studio cellist can supply an effortless bass line as part of a string section (as well as emerging as a stunning solo instrument), so hiring a cello for recordings can add real diversity to a track. Listen below to the sound of a solo cello or small cello section. Alexandra studied at the Royal Academy of Music in London, where she graduated with a BMus (First Class Hons.) a performance diploma and prizes including the Patten Award and Carr Prize. She gained a Masters degree and Artists Certificate from the Manhattan School of Music. She has participated in many music festivals including Tanglewood, Sarasota, Yellow Barn and Ravinia. Alexandra has toured throughout Europe, North America and Asia as a soloist, recitalist and chamber musician. She has performed with numerous orchestras in New York and Europe. An avid chamber musician and passionate supporter of new music she performs at the 'Conversational Concerts' series at the Warehouse, London. Alexandra can frequently be heard on National Public Radio in New York and has played for Classic FM, Radio 3, the World Service and German National Radio. She is also the solo cellist on 'Little Star Lullabies' - a beautiful album of orchestral music designed to help children and babies sleep. She has recorded for VOX records, SONY records, NAXOS and Oxford Classics. The latter of which includes a set of Mozart String Quartets. Alexandra has notably appeared at Carnegie Hall, Weill Hall, Alice Tully Hall, The Royal Albert Hall and the Southbank. She has recorded with artists as diverse as Michael Jackson, Ghostface Killah, the 'Choir Boys' and renowned jazz vocalist Abbey Lincoln. In her work with the London Symphony Orchestra she was part of the backing tracks for the best selling album of the year in the US - Josh Groban's 'Noel'. Alexandra plays on a Matthew Hardy cello, made in 1818, purchased with help from the Foundation for Sports and the Arts. Julia studied at both the Royal Academy and Royal College of Music - she was the recipient of multiple prizes at both institutions. 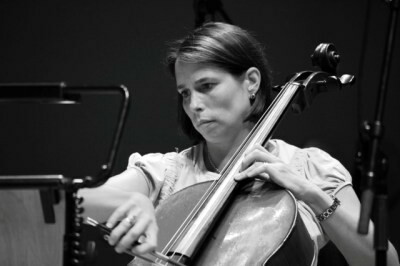 Having held positions with English National Opera, English Sinfonia and the BBC Symphony Orchestra, Julia currently enjoys an active career as a freelance cellist - playing regularly with the English Chamber Orchestra and the London Chamber Orchestra among others. As a recording artist, Julia has wide experience in many genres, having appeared on countless film soundtracks, pop and rock recordings, computer game soundtracks as well as more serious classical chamber releases. Julia appears on the Manor House String Quartet albums 'I Saw Three Ships and other carols' and 'It Came Upon the Midnight Clear and other carols', both of which received critical acclaim and are regularly played on Classical Radio stations worldwide. Tony Woollard studied with David Smith and Raphael Wallfisch at the Guildhall School of Music in London and later won a Swiss government scholarship to study for four years with the great British cellist Robert Cohen in Lugano, Switzerland. After winning several competitions including the John Lill award and the South East Music Award, he was a finalist at the European Beethoven competition and represented Britain at the International Tchaikovsky competition in Moscow. As a chamber musician he has played with the Fitzwilliam and Alberni string quartets and for many years was the principal cellist of the European Union Chamber Orchestra. During this time he toured Europe and the Far East. He has given live radio broadcasts of solo contemporary British music in Switzerland and New Zealand. 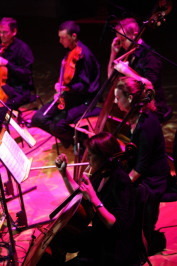 Tony appears as a soloist on the orchestral album 'Music For Healing'. by Vaughan Jones. He plays a British cello made by Viola Ziessow in 2000.